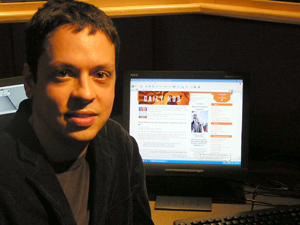 Is Daily Kos founder Markos Moulitsas growing weary of the vitriol being expressed at his blog? It appears so, as without explaining what incidents precipitated the need for such, Moulitsas posted a warning to his readers Monday referring to "nasty rhetoric" that is "rampant in the primary war diaries." Maybe Charles Johnson was prescient Sunday when he wrote, "Just doesn't look right to be dissing the military when Kos is trying so hard to be the voice of the Democratic Party." There has lately been an alarming rise in diaries and comments that seek to impugn (without evidence) the motives of those they disagree with on various issues. Yes, there's the impeachment stuff, but this nasty rhetoric is also rampant in the primary war diaries. This points to a serious breakdown not just on civility, but in the ability of people to properly debate various issues. As such, it presents a serious threat to the integrity of this site. I much prefer it when the community moderates itself, and for the most part it does a good job of this. The libertarian in me prefers it that way. But sometimes, self-moderation isn't enough. I'll act swiftly and mercilessly when I'm pushed into defending the effectiveness of this site. And at this moment, my patience is wearing thin. Interesting. Has Markos suddenly been "pushed into defending the effectiveness" of his site? Is it possible that leading Democrats and/or advisors have contacted Moulitsas to warn him that this kind of behavior could make it difficult for them to attend his YearlyKos convention? Certainly, something is changing here, wouldn't you agree? As a site, we strive to provide a safe haven for debate on these matters without it getting -- as has happened of late -- so damn ugly. This is my one and only warning on the matter. I'll try to be an optimist and hope that this is the last time I'll have to address it. I won't let this site become as nasty as your typical usenet forum, and those who encourage that sort of environment should consider themselves duly warned. It would be interesting to know what diaries or comments have specifically raised Markos' concerns. And no, Bush won't cancel the next round of elections to remain in power. That's about the most ridiculous conspiracy theory I've seen in a long time. Some people on our side can be just as "out there" as the "black helicopter" crowd. Coming down on conspiracy theories? That's what this site has been about since its inception. Anybody get the feeling that Markos has been "ordered" to issue such a warning if he wants to continue to be a Democrat Party insider with access to high-ranking officials and candidates? Furthermore, with this warning coming so soon after the JetBlue debacle, one has to wonder how that relates. After all, despite his posturing, this had to be an embarrassment, and a highly-publicized one. Might all of this focus, and JetBlue's decision, be making Democrats leary of future involvement with Markos unless he can quickly wrest back control of the asylum?